George Strait's son Bubba Strait shares his passion for rodeo and country music with his famous dad. Enjoy reading more about publicity-shy Bubba Strait! George Harvey Strait Jr. aka “Bubba” (George Strait son), born in 1981, is the second child of George Strait and Norma Strait. While in college at Texas A&M, Bubba began his competitive rodeo career. After graduating, he became a Professional Rodeo Cowboys Association (PRCA) team roper. Team roping is a passion shared by Bubba and his father. “It’s the greatest feeling in the world to watch my son win a roping, or even to just watch him compete”, states George Strait in a 2004 interview with The Team Roping Journal. He adds, “Bubba and I have been fortunate to win a couple of buckles together, and that, my friends, is the ultimate.” Team roping isn’t the only passion these two share. Bubba has also shown talent as a songwriter. On August 11th, 2009, George Strait released his 38th album (26th studio album), Twang. The album was Strait’s fifth to debut at No. 1 on the Billboard 200. It also marked the first time since 1982 that the “King of Country” had songwriting credits on a record, including the first single, “Living for the Night,” co-written with the legendary Dean Dillon and George’s son. Bubba Strait co-wrote three songs and solo wrote “Arkansas Dave” for the album. Currently, Bubba and his wife, Tamara, make their home in Texas hill country with their young children Jilliann Louise Strait and George Harvey Strait III aka “Harvey.” Tamara is a successful realtor who is dedicated to organizations such as the Methodist Hospital’s Children’s Center, Wish For Our Heroes, and David Feherty’s Troops First Foundation. Watch the father-son duo perform “Arkansas Dave” below! 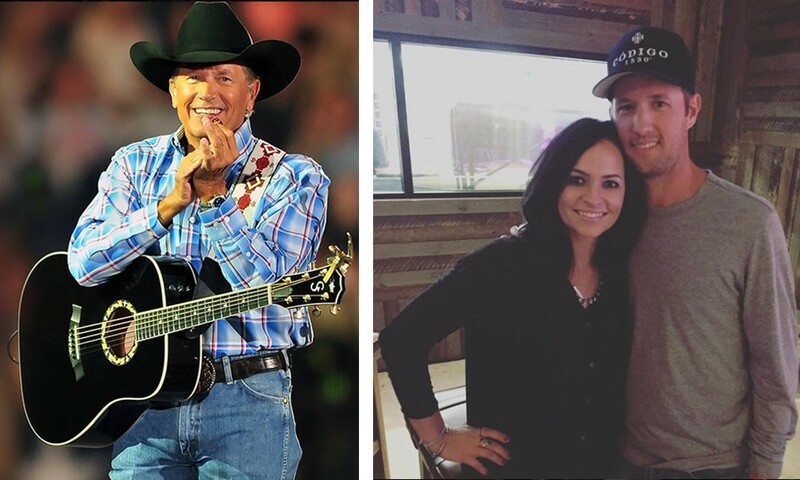 Be sure to share this look into George Strait’s son and family with other country music fans!